We picked all items for under $ 20 for you, but really great quality. Some are bestsellers on Amazon! Number one of the useful Travel Items is a Power Bank! When we are traveling, it is so important for us to have a small power bank with us! It is super annoying when you are somewhere and you can’t charge your phone. We need our phone for GPS to find our way, we are having all the stars on Google Maps for all the landmarks as well as we are using it often to take photos! This power bank is one of the bestsellers on Amazon and for this price you can’t go wrong! It fits in every backpack or even in your pockets! I use refillable travel bottles for my shampoos, conditioner since the last 5 years. All the plastic we use and throw back after is so bad for the environment! And who needs a full bottle of shampoo or conditioner on a 2 or 3 week vacation? Even when we are going on long backpacking adventures for a couple of month, we don’t take the huge shampoo bottles, we fill it in our refillable travel bottles, which lasts us for the first weeks! This is something really important for me, that we all take care a little more of our environment. Sorry for saying that, but especially Americans love to use plastic and throwing it away! I have never seen that many straws in my whole life than in my 3 month america trip! 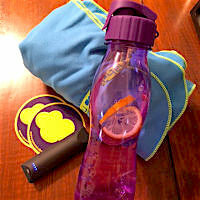 I have always, even at home a refillable water bottle (BPA free) which I take when I leave the house to go shopping, go to work, etc. Cut a slice of lemon in and it will tast super delicious! I picked a really good one for you, which is BPA free and will last you a long time! We bought 2 microfiber travel towels before we headed out on our 3 month South East Asia Backpacking Trip and since then we never went on a vacation without this towel! It dries super fast and it very soft as well. We use it as a beach towel as well as a shower towel sometimes. This is a really useful item when you are backpacking! Amazon has it in different sizes and colors and we can highly recommend to buy one if you don’t have one yet. They don’t take much space in your backpack or suitcase too, which is great! We have several of these foldable bags, because they are super practical! We have one in the car for grocery shopping, I have one in my purse and we always take one on trips. When we are going to the airport we have our drinks and food for the journey in it and after eating our snacks, we fold the bag and put it away. It is super easy and comfortable to have a foldable and reusable bag. And it also looks better than a plastic bag! It can even get wet and will be ok, because it is made out of nylon! This is for sure one of the useful travel items. This is an important item too and should be on the list of useful travel items! You are lucky if you never lost a suitcase or anything. But with all the chaos in the airports, bus stations, etc. it is really useful to have a travel tag. It doesn’t cost a lot. This here is $ 7.89 at amazon and comes with you! You can pick a color you like and it is good material. They have the paper ones at the airports too, but these ones get ripped of easy. Whenever you travel to Asia, South America, etc. it is good to have a waterproof case for your phone or bills. We had a lot of boat rides in the Philippines, Thailand, Vietnam, etc. and it is always good to make sure your phone and money is safe. Even on kayak this universal waterproof phone case is great. It happened one time that our kayak flipped over and this waterproof case saved our life, ehm our phones haha! We had so many problems with overweight luggage last year in Asia. Some airports are really strict, which is pretty annoying! We had to open our backpacks in line at the ticket counter to throw stuff away, because overweight is so expensive. So we just bought this digital hanging luggage scale to make sure we are fine the next time! It is super easy to use and small enough to take it on your trips. You just hang you backpack, suitcase, carryon luggage on it and it tells you the weight of it!